The trip started with Blodgett Canyon Trail 19 towards the footbridge. First we pass along the Don Mackey memorial Site. Don Mackey was a firefighter killed in a wildfire in Colorado. A local to Blodgett Canyon, Don was a Bitterroot Hotshot in 1985-1986 and a Smokejumper from 1987 to 1994. Along the flat (5.5% average Grad) trail for 2.9 miles there impressive views of the canyon walls above. Crossing the Blodgett Creek Footbridge. A nice spread on this 4 point muley who tried to visit the camp several times. 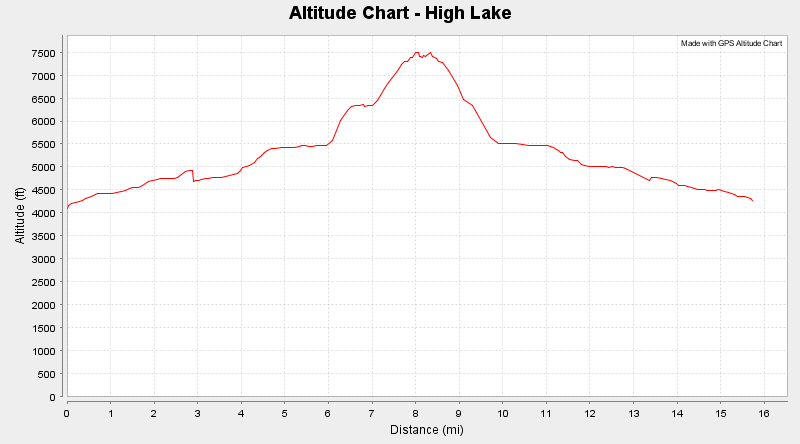 In the morning we headed off towards High Lake with another 2.9 miles at 5.1% average grade to MT Trail 303. Approximately 1.5 miles after the footbridge we hit the Blodgett Canyon Falls. Approximately 3 miles in we hit the turn off for trail 303 towards High Lake. From here you will cross the creek twice, for one there is a gravel bar to cross, the other we had to cross a very slippery log. At the second crossing you will want to refill your water as it will be the last place on trail until you hit the lake, although if needed you could venture off trail later. That water will be important for the steep stretches to come. 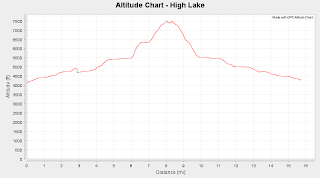 After approximately 1500ft there is another 1000ft at approximately 44% grade, luckily its all shaded. The following half mile is relatively flat. Be sure to keep your eyes open, there's a lot of tree fall which makes the trail seem to disappear. The trail is there so keep your eyes open, at this point in the hike you should not be rock scrambling unless you want to. The next half mile is steep, seemingly more than the average 26% grade the GPS shows. This stretch is not shaded and you are fully exposed to the sun. Once at the top things level off a bit and there are great views of the canyon. Once at the lake we notice a small cabin with a sign dedicating the lake to Malcolm Sizer. I couldn't find much information about Malcolm Sizer but apparently the man had forethought. With time running out and being we had our four legged companion we returned the same way we arrived although there is another trail which appears more direct and therefore more steep.